OK. So the waffle weave sampler turned out pretty well except for the bleeding red yarn. With the information it gave me, I pressed on to the barcode inspired dishtowels with confidence. 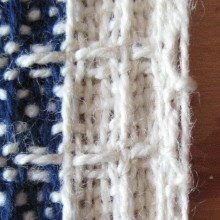 However, after several inches of weaving, I was puzzled when my selvedges looked like the photo on the left. Even though I am using a floating selvedge warp thread, I was having a problem catching the outermost warp thread (which is not the floating warp). What was the problem? This hadn't happened on my sampler. I rechecked my threading, but everything was fine there. No mistakes in the point twill threading. I decided to take another look at waffle weave in Mary Black's Key to Weaving. It didn't take long to diagnose my problem. 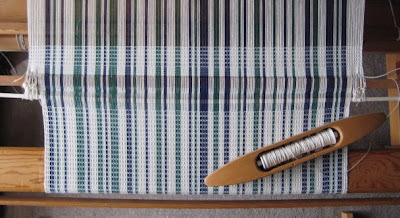 The other selvedge was the same way, so that the threading started and ended on shaft four. Threading is supposed to start and end on shaft one. It would seem inconsequential, but because of waffle weave's tie-up and treadling, it's not! That was light bulb moment number one. Light bulb moment number two came while trying to decide how to correct the threading. I didn't know if it would be better to add or subtract some warp to have it start on the first shaft. To decide, I decided to recheck my project width math. From sampling, I had learned to expect about a 30% loss in width after washing and drying. 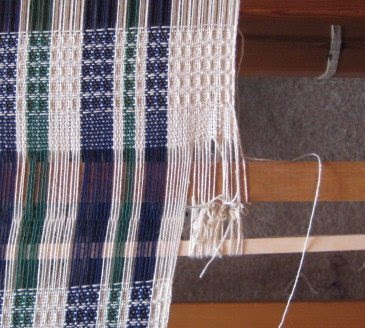 To determine the width of my warp, I had taken my project width (18 inches) and added 30%. From that calculation I measured 702 warp ends, which measured 23.5 inches in the reed. This time, I subtracted 30% from the width in the reed (23.5), and was surprised when the result wasn't 18 inches, but about 16.5. Well, duh. 30% of 18 is not the same as 30% of 23.5. 30% of 18 is about 5.4, while 30% of 23.5 is 7. Light bulb moment number two was in realizing that how I calculated draw-in and shrinkage made a big difference in the final width of my project. My challenge then, was to add enough extra warp for my finished project to be 18 inches, while starting and ending the threading on shaft number one. What I did was to use Peggy Osterkamp's 2-Stick Header, and tie my additional warp on to it. You can either click on the above photo to enlarge it a little, or there's a close-up below. I weighted the two bouts of warp in the back with half gallon milk jugs filled with water. I was able to experiment with the amount of water in each jug until I got a straight, even fell. This does widen the borders quite a bit, but who in the world (besides my readers :) is gonna know that I didn't plan it this way in the first place. Next time I would use a stouter stick to tie the warp onto, although hopefully there won't be a next time. And perhaps someone has a better idea? Two enlightening flashes of understanding are enough for me in one day. I'm rather worn out from it all. Believe it or not, I've been wondering if I could do something like this! Until I figured out my sett problem I thought I would have to add warp! and wondered how. Now I know it can be done. So clearly explained - thank you! Leigh, I'm quite new at drafting and understanding weave structures. Even so, I was intrigued by your comments above about starting on the (wrong) Shaft 4 instead of the (right) Shaft 1. Because I read drafts the Scandinavian way, my Shaft 1 IS the same as your Shaft 4. I don't know for certain, but I'm guessing that a change to the tie-up and treadling sequence would have achieved the correct weave effect. What are your thoughts on this? Cally and Susan, thank you. Your comments are encouraging! K, I think you are absolutely correct about the tie-up and treadling sequence. If both were "reversed," then there shouldn't be any problems with the selvedges. The tie-up involves some treadles lifting either 3 shafts or one, hence the problem with the selvedges. If everything were reversed, that problem thread would be caught in the weft more frequently. Thank you for your comment and thoughts. Very intriguing. When I started reading your post, my initial thought was to reverse the tie-up and/or treadling; but when you started to talk about the width of the towels, I went, "Uh oh." I like your solution. I think the additional white sets off the stripes more and gives them more of the focus, if that makes sense. What a great solution for this problem and I do like the wider white strip. Barcode pattern is fantastic. Oh well done Leigh! Good to learn about this trick. I like the look of the stripes there. I am sure this will come in handy one day! What a save! I love the colors too. You're right - no one will know, perhaps because the way you supplemented provides a "frame" for the earlier work. Terrific and ouch at the same time! Whoopsie! Great save! I live how the barcode is looking. I really want a loom, it looks so fun.